I would be surprised if you hadn’t heard of the stunt pulled by the quasi anonymous and controversial street artist, Banksy. It seems nowadays anything the artist does appears on the television, all over social media, and in the newspapers, around the entire globe. The stunt occured on October 5th at Sotheby’s auction house in London. It has shocked and excited the art world, and will go down in art history as the first piece of live performance art to be created during an auction (now with the new title, ‘Love is in the Bin’ (2018)). As you may know, street artist Banksy is known for his foolery, especially within the institutionalised art world. Some pranks have included secretly placing pieces of art into exhibition spaces, without museum staff noticing for hours on end (MoMA, British Museum and The Met, to name a few). So, let’s see if we can take inspiration from this daring, powerful stunt. Famous for the messages that the artist portrays, Banksy is well known for using art to make a statement, and opening people’s eyes. Similar to what we do here at AimAtArt. We use art to make people see things with more clarity, and from a different perspective. For the better! The artist first posted a photo, followed by a video, on his verified Instagram account (banksy). 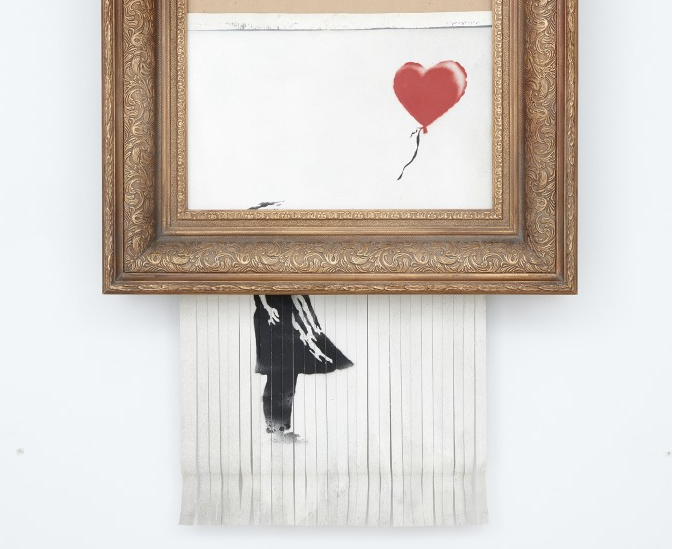 Banksy revealed that when creating the frame for the iconic print ‘Girl with Balloon’, anticipating the day that the artwork would be put up for auction, a shredder was placed into the bottom of the frame with a trigger, that when set off, the artwork would partly ‘self destruct’. On the evening of the auction, ‘Girl with a Balloon’ met the artist’s previous record – selling for a 1.4 million pounds. Moments later, the artwork was partly destroyed, before being carried away by shocked Sotheby’s staff and, yet again, securing Banksy’s place in art history. So, let us question – Is your company using social media/your communication methods to its full potential? How can we use it, for the better? The use of social media in spreading a message, sharing and communicating, is often underestimated. Why not be more creative with your social media? Afterall, some consider Banksy to be a media artist, more than anything, today. Dare to be different? Who knows, by doing so you may make an idea, or a moment, even more valuable than previously thought. If anything is to go by, Banksy’s fame is inspiration to think and act as an artist does. I know for sure, I’m inspired. The artist has always remained true to his roots. Creating meaningful art, placing it in public places, for everyone to see and to understand. Some say that the artist makes art for the greater good. However, the thing is, Banksy’s art attracts so many people mainly because of its public nature. It’s accessible for anyone and everyone to interpret. Begin to think – in what way can your company reach out to as many people as possible? Create a turning point for your company. Create something that won’t go unnoticed. A strategy for directors as well as mechanics? We can make it happen!